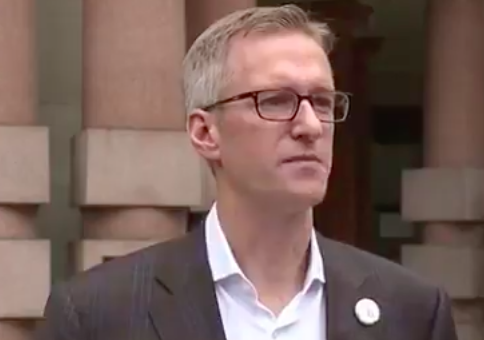 Portland, Oregon's Democratic Mayor Ted Wheeler has asked the federal government to revoke its permit for a pro-President Donald Trump, pro-"free speech" rally. A man shouting anti-Muslim slurs on Friday attacked three people with a knife on a Portland commuter train, killing two and wounding a third. The suspect, 35-year-old Jeremy Joseph Christian, has a history of making bigoted statements online and was once pictured making a Nazi salute. Wheeler responded by setting his sights on shutting down a "Trump Free Speech Rally" and a "March Against Sharia" scheduled in downtown Portland the next two weeks, the Washington Post reported. Both demonstrations were organized by Trump supporter Joey Gibson, leader of the group Patriot Prayer. "I have confirmed that the City of Portland has NOT and will not issue any permits for the alt right events scheduled on June 4th or June 10th," Wheeler wrote in a Monday Facebook post. But Wheeler also noted that the free speech rally received a permit to use Portland's Shrunk Plaza, which is owned by the federal government. "I am calling on the federal government to IMMEDIATELY REVOKE the permit(s) they have issued for the June 4th event and to not issue a permit for June 10th," he wrote. "Our City is in mourning, our community’s anger is real, and the timing and subject of these events can only exacerbate an already difficult situation." Gibson on Sunday denounced the murders, but also castigated those in Portland who were citing the attacks as reasons to shut down his event. "They’re using the deaths of these two people and Jeremy Christian — they’re using it to get Portland all rowdy about our June 4 rally and it’s absolutely disgusting," he said. Gibson also asked supporters not to resort to violence at the rallies. "You throw one punch, you’re going to jail," Gibson said. The Oregon American Civil Liberties Union has taken Gibson's side, posting a tweetstorm on Monday denouncing Wheeler's actions. 4. history shows us that the most marginalized will be disproportionately censored and punished for unpopular speech. 5. We are all free to reject and protest ideas we don't agree with. That is a core, fundamental freedom of the United States. This entry was posted in Politics and tagged Joey Gibson, Portland, Ted Wheeler. Bookmark the permalink.